The Siren’s Song is the freshly released, Jeff Tweedy-produced fourth album from Saskatchewan folk duo of cousins Kacy Anderson & Clayton Linthicum. 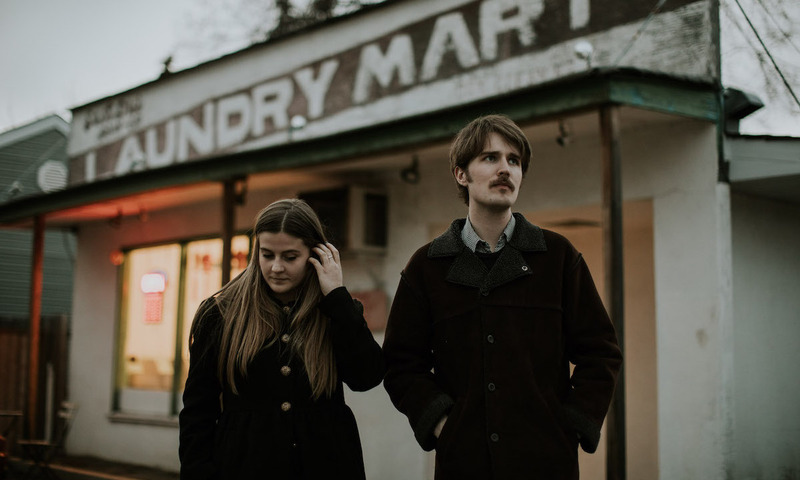 Following their highly acclaimed 2016 New West debut Strange Country, Kacy & Clayton tap even deeper into the bottomless well of folk and country influences from North America and the British Isles. While carefully reaping centuries of rural traditions, the duo blossoms into something modern and timeless built on equal parts intricate guitars and angelic vocal harmonies. The Washington Post just named The Siren’s Song the front-runner as the year’s best album in the Canadian-British-Americana country-folk category, and we highly encourage you to give it a listen. Congratulations on your new album! How would you best describe it? Thank you! This is the first record of material we’ve made that can be performed at rodeo dances if need be. How do you view The Siren’s Song compared to your debut album, Strange Country? On our first three albums, we wanted to take these regional folk traditions — Anglo-American balladry, Piedmont blues, sea shanties, Cajun music, etc. — and write music that could be mistaken for traditional songs. With The Siren’s Song, we attempted to make an album that synthesized the influences of our previous records with the production and writing style found on country records circa 1965 and the groove of South Western garage rock groups like the Sir Douglas Quintet and the Bobby Fuller Four. So far, so good! It’s been getting quite a lot of public radio and media attention here in Canada. My dad recently recited an entire song from the album to a group of his friends, so I consider that a success. How did you celebrate the album release? With a big bag of Miss Vicki’s kettle chips and a pint of cider. Awesome! What is your next move going forward? We’ve got tour dates planned for most of the fall that will take us through parts of Canada and the US, and also plan to tour the UK and Europe in the new year. The galloping high-hat and pulsating guitar vibrato on “Poor Moon” really propels my Honda CR-V and me down the road. Here’s to Domino Records for reissuing this 45-year-old masterpiece and here’s to the Watersons and the community that surrounded them and played on this record. Bridget St. John’s version was my introduction to this song, written by Terry Hiscock(Hunter Muskett). The chord progression and Gordon Huntley’s steel guitar part cause me to feel a pile of feelings. When we finished making our new album in Chicago this past January, we had plans to go see Steve Gunn at Thalia Hall. Unfortunately, the spring rolls we ordered at a Vietnamese restaurant took much too long to prepare and we missed the show. Not to be denied, our drummer Mike Silverman and I watched a bunch of his KEXP sessions in our rental apartment, which is how I discovered this song. When I saw Bob in Edmonton, Alberta in July, he ended the show with this song. He played a bunch of the standards he’s recorded on the past few albums that night but this was the most striking. The bowed bass and steel guitar and vocal performances were out of this world. This song perfectly communicates such a complete scene and conversation between a son who has lost contact with his rural roots, and his aging father on the farm. Big Joe Turner sings this jump blues with Pete Johnson on piano. I first found out about this record when I heard Bob Dylan borrowed from it’s intro for his song, “Summer Days” (from Love & Theft). Bobbie Gentry’s records are among the most interesting and least categorizable of ’60s pop music. This song comes right out of the middle of a 5-song suite that makes up the B-side of her Delta Sweete LP. The range in melody and depth of this arrangement inspire me every time I hear it. Best song to listen to while on tour? Saskatoon legend Shakey Wilson turned me on to this truck driving anthem and it often plays in my mind while trying to navigate and park a pickup/U-haul trailer in the cities of America. Favorite song that you’ve written or performed on? This is one of the greatest agricultural songs ever written according to me. It was a privilege to sing this Etienne Soulodre song with these Saskatchewan sweethearts. Merle Haggard always has the best song to listen to at any point in time. One thing kids and dads can bond on is Roger Miller. This was a favourite track to listen to in my dad’s truck. Best song for when you’re head over heels in love? I think that this is a universal hit for universal lovers to dance to. The best melody to sing while crying. The song you’ve probably heard more times than any other. I have been to many rural dances and listened to a lot of local country radio since 1997.